On 28th September 2006, Bill Clinton, addressing the Labour Party Conference, introduced the idea of ubuntu to the British public: ‘society is important because of ubuntu…If we were the most beautiful, the most intelligent, the most wealthy, the most powerful person – and then found all of a sudden that we were alone on the planet, it wouldn’t amount to a hill of beans,’ said the former president. One individual especially moved by this was Sandy Lawrence, a Miami-based businesswoman, who organised international conferences, attended by thousands, to educate investors about natural resources. Her work took her from the Unites States to Asia and to Africa, where she first learned of ubuntu. In 2005, after twelve hectic (but fun) years, she sold her company, International Investment Conferences, to private equity, before buying a ninety-acre estate in Napa on Mount George complete with its own winery, Lion’s Run. A devout yogi and qualified instructor, she put her beliefs into practice here, hosting retreats at her home. One august evening in 2006, after her weekly Thursday night session, she attempted to arrange a vegetarian dinner for her guests. The best that local restaurants could prepare was shrimp risotto minus the shrimp. It was this, compiled with the fact that classes were growing too big for her house that first led her to entertain the notion of a restaurant/yoga studio. Shortly after, on a walk down Main Street, she stumbled upon a vacant building available for lease – it was love immediate. Only then did the concept quickly crystallise. Lawrence also needed a capable chef who shared her sensibilities. Inviting several to audition, one stood out, ‘nail[ing] every single dish’, including a cauliflower hotpot with vadouvan that ‘landed him the gig’. His name was Jeremy Fox and he had come from Manresa. She offered him the job and a partnership. 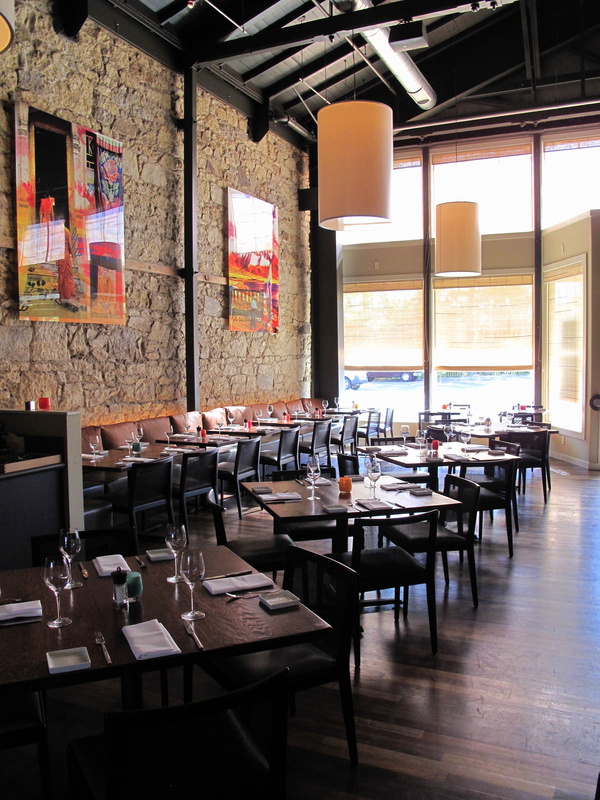 He accepted and made the ninety-mile move north to Napa from Los Gatos with wife Deanie, who had not just made the desserts at his try-out, but was chef de pâtisserie at Manresa too. Even as a kid in Cleveland, Fox knew he wanted a restaurant; ‘my grandparents owned a pizzeria in Chattanooga; as a [child], I associated good times with eating in the restaurant. I didn’t start with the intention of being a chef, but once I started cooking that was all I wanted to do.’ As a teenager, he moved to Atlanta, where he started his culinary career at the local Chick-fil-A. After a stint at Mumbo Jumbo, he entered the College of Culinary Arts at Johnson & Wales University (then in Charleston). As he studied, he worked at Anson Restaurant, ‘where he got yelled at a lot’, but also realised ‘what good ingredients were for the first time’. In 1998, he left J&W, only a couple of classes short of acquiring his degree, to cook fulltime; he was to spend five years at Anson, which included a stage in Belgium at two-star De Snippe. In 2002, although (or maybe because of) growing up a fast-food-fiend on a Burger King diet, he ‘became obsessed with California cooking and the philosophy of using things straight from the farm’; he delighted in reading menus he had had Bay restaurants fax him. Soon enough, he realised the inevitable, he ‘wanted to [go] out to where all the vegetables were’. And so he did. Fox arrived in California the week before nine-eleven and, initially struggling to land a job, eventually found himself at Rubicon in San Francisco. It turned out that serendipity had led him here. As he toiled at the meat counter, local girl Deanie Hickox made pastries. One day the two went for coffee together at Café Vesuvio – Fox still remembers the menu he cooked that service (squash blossoms stuffed with chard stems; chicken galantine, boned and stuffed with green garlic; and grilled peach panzanella). Four years later, having won over her whole family with that very same panzanella, they were married. Not long after they became an item, the chef left Rubicon. 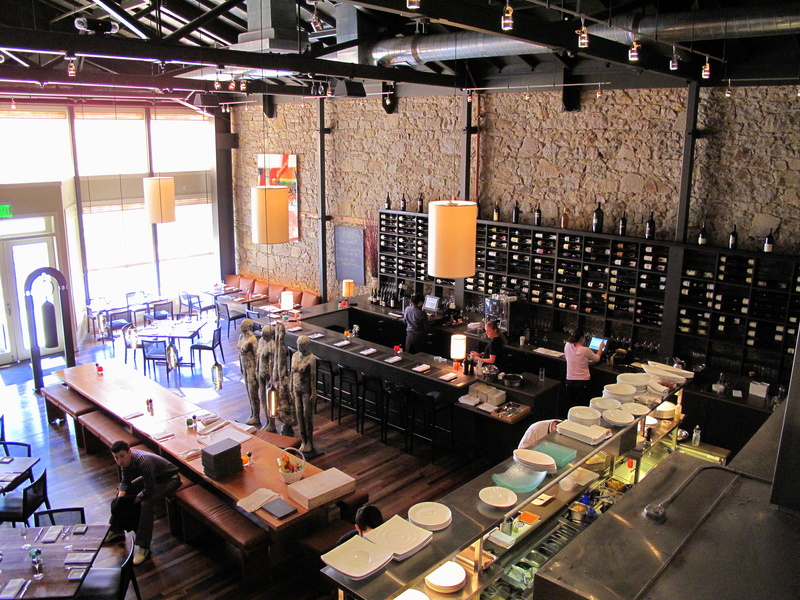 Although he had his heart set on somewhere else – Manresa – he moved to Charles Nob Hill until 2003, when he finally landed a stage at his dream restaurant. ‘It was a beautiful kitchen. Everyone was so serious and the food was so beautiful. And people weren’t running around and yelling – it was a lot different from a lot of restaurants I had worked in.’ He loved it. He wanted to stay permanently. Futile efforts to contact Kinch followed however, until Deanie advised him to ‘just show up’. Lucky for Fox, the day he did just show up, another cook failed to come in. He was given the job. So eager was he to work here that, although he already had some six years professional experience behind him, he willingly began at the bottom, ‘wash[ing] the wok and make[ing] staff meals’, ‘stay[ing back] late at night pitting fresh cherries after dinner service.’ Within only two years, he had gained experience at London’s St John and Royal Hospital Road (3*) and been made Manresa’s chef de cuisine. Deanie too knew early on a future in food beckoned – not your average adolescent, when her parents were out of town, she would throw dinner parties for friends. After high school, she worked various non-kitchen related roles, but ultimately enrolled at the California Culinary Academy to study pastry. During her final months there, she started at Rubicon and met Jeremy. After he moved on, she soon did the same, joining Icing on the Cake in Los Gatos before joining Jeremy at Manresa, where, having initially helped out one day a week in the patisserie section, she became its head. Both Foxes credit David Kinch as their biggest influence. Jeremy remembers that ‘he was never satisfied with what already knew. Even in his forties, he was hungry to learn and evolve.’ What motivated him was that ‘[Kinch] was well-known but wasn’t just turning out the food he was known for. He made me love cooking again and I think he took me under his wing pretty quickly.’ Whereas, Deanie claims Kinch ‘pushed me to experiment within the pastry realm…He would ask me to try things out, things that would never occur to me.’ The pair cites his creatively and complex layering of flavours as especially important lessons learned. 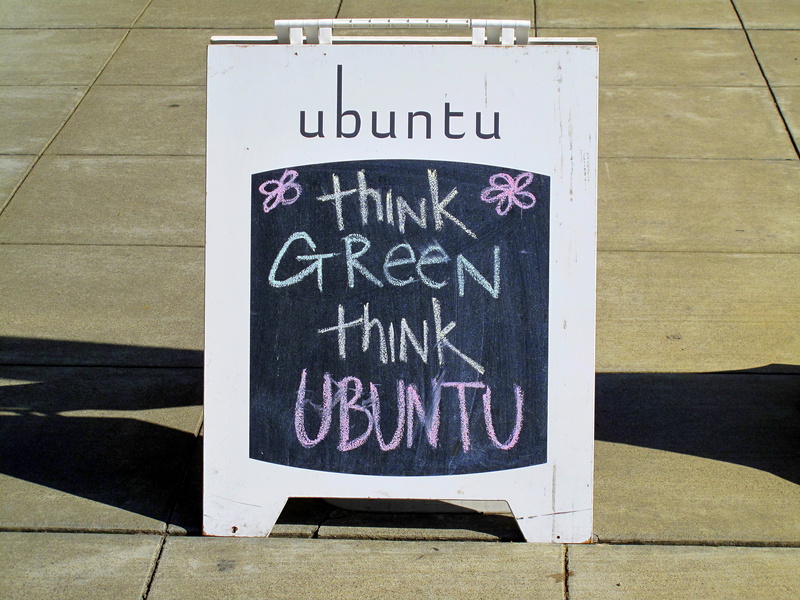 Opened in August 2007, Ubuntu itself is the personification of the owners’ green philosophy. 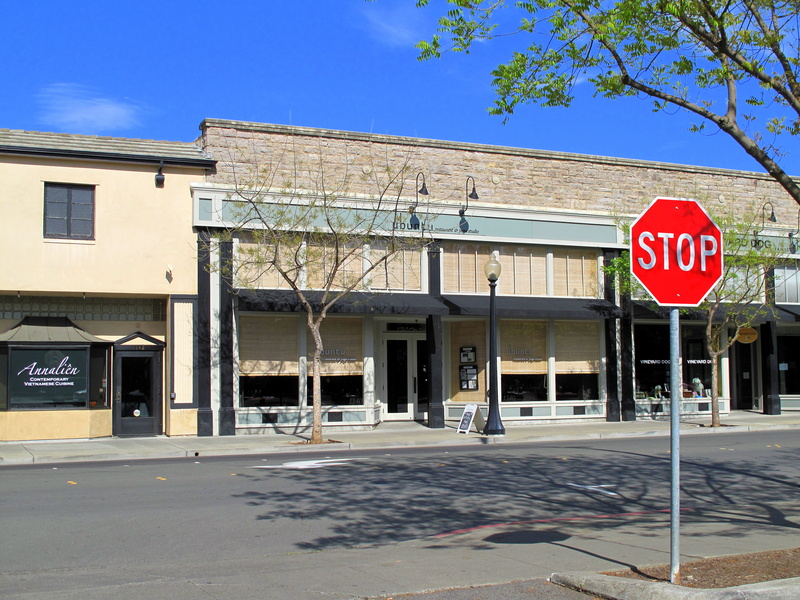 Residing on ‘restaurant row’ in downtown Napa in the, nineteenth-century Kyser-Williams block building, the eighty-five seat former futon store has been redesigned and refurbished by architects, Michael Bauschke and David Berman, designer T. Beller and consultant Michael Dellar, who together have turned it into an exemplar of environmentally-friendly design. 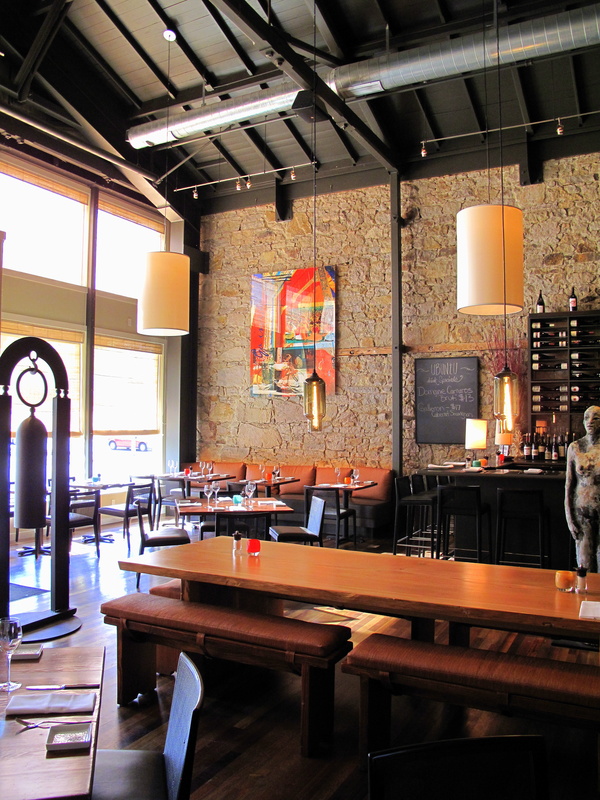 The façade – once metal, stucco and mission tile but restored in 1999 – suggests quintessential small town eatery. Creamy-corn-coloured Roman blinds of canvas swathe large windows which wrap the width of the frontispiece whilst pale powder and cobalt blue bands border and criss-cross its face; ubuntu is stencilled quaintly upon the glass. The interior is, in contrast, more polished and stylish, and surprisingly vast. Immediately through the door, one is met by a large sculpture of a recycled oxygen canister recast like a bronze bell. Beyond this, there is a twenty-foot long, twenty-two seat communal dining table refashioned from a fallen redwood that points to the open kitchen resting along the back. This stainless-steel square is the centre of considered activity, its centrepiece a large oven. Above it is the smell and sound-proof yoga studio, reached by a set of wide stairs on the far right; its frosted glass exterior offers only the outline of real life with just shadows and silhouettes visible. 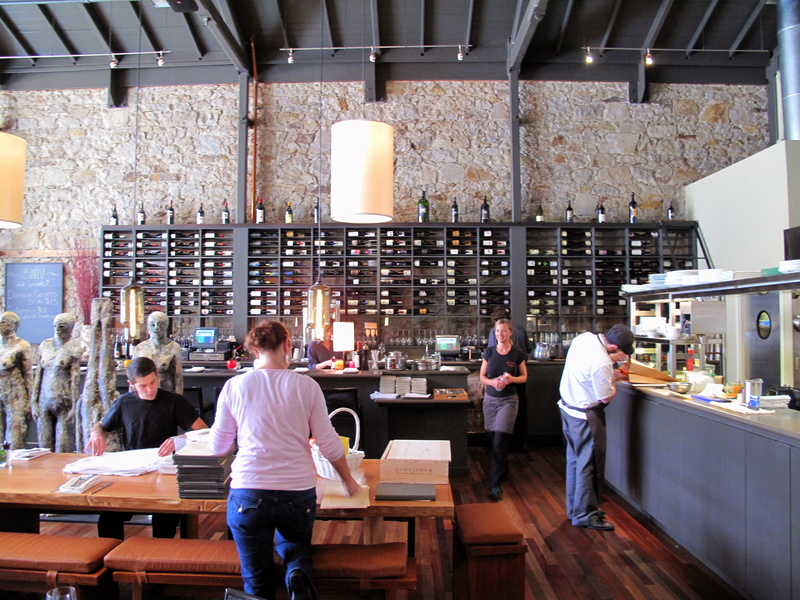 Along the left wall, stools surround the black bar backed with glossy shelves that carry the circa two-hundred strong wine collection, the majority of which are sourced from sustainable growers. Old Asian shipping containers, reincarnated as streaky, mottled wooden flooring contrasts strikingly well with walls of exposed stone and trestle ceiling that flash the room’s piping, girding and air ducts. Along with ample sunlight during daytime, there are six, oversized cylindrical drum pendants and a line of smaller tin lanterns that dangle over the central table. 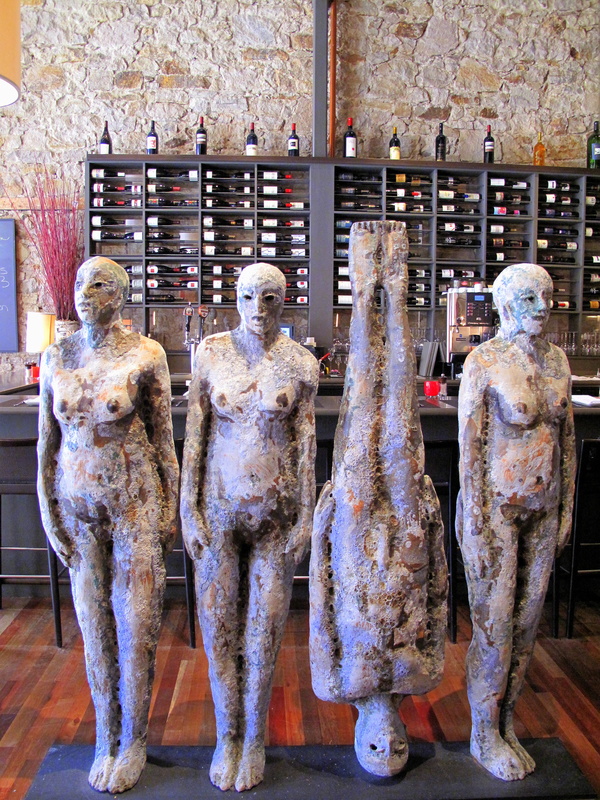 One’s attention is attracted by a large statue of four weathered ceramic ladies side-by-side (three standing upright, one on her head) entitled ‘Alternative View’ by Mark Chatterley. Against the beige-buff brick, injections of colour come by way of big collages, put together in France and comprising Lawrence and (yoga instructor Veronica) Vidal’s personal photographs; some boast inspirational messages, such as ‘make your heart big’. Chairs and tables, hand-crafted locally from reclaimed wood by Heritage Salvage in Petaluma, are coupled with two-tone rusty copper and grey banquettes that bound the walls. More recycled furniture can be found outdoors, where the patio furnishings all from the forties. The crockery is Heath and O! Luna with each naked table topped with a candle holder of different hue. When Aaron and I arrived, we were warmly welcomed. Before menus were shown, the morning’s pickings were shown off: a huge cutting board bore oxheart carrots, purple artichoke, golden and purple kohlrabi, fennel, sage, thyme…Then, instead of the carte, Jeremy Fox told us that the kitchen had put together a tasting menu for us, should we like to try it. We did. Aperitif: Brut Cuvée NV Domaine Cameros, Cameros, 2006. 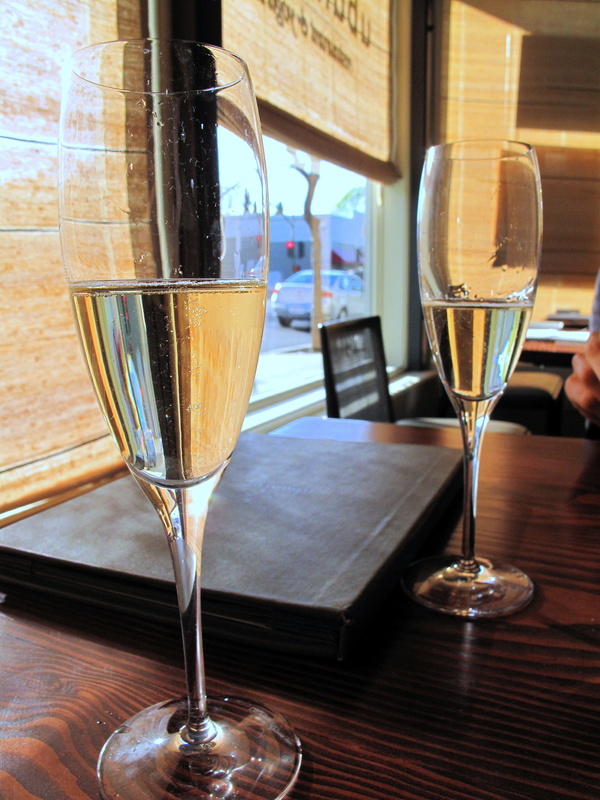 This local sparkling wine from Tattinger was fruity and gently acidic with long, velvety finish. 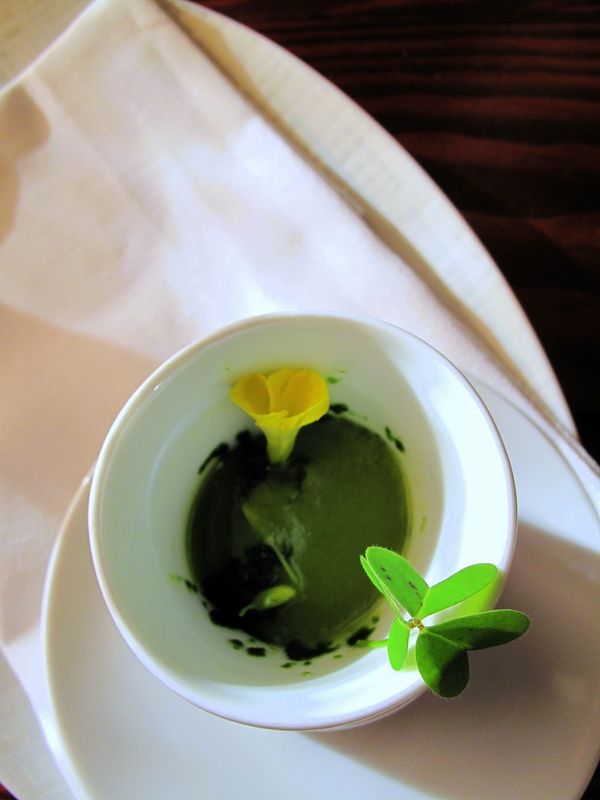 Amuse Bouche: NETTLE and LEMON BALM ice vegan ESCAROLE veloute, WILD SORREL; and marcona almonds, LAVENDER sugar, sea salt. 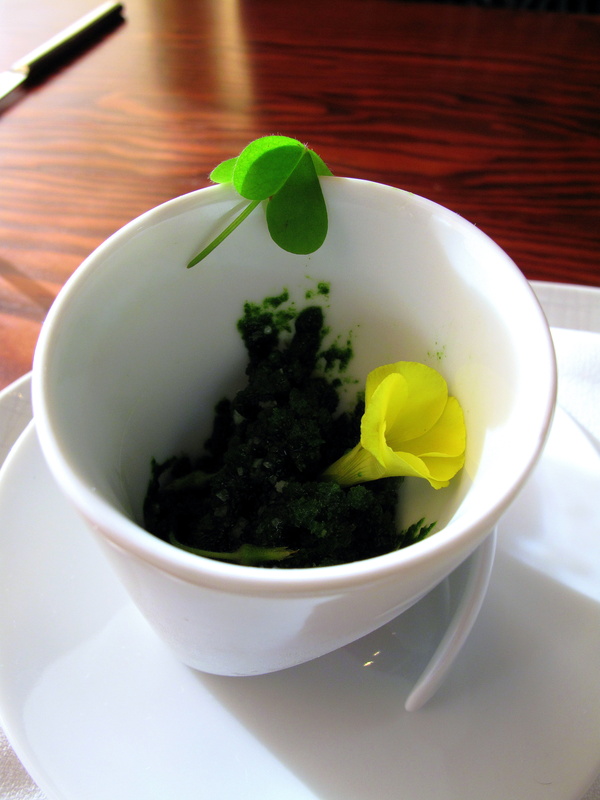 Nettle, lemon balm and shiso granité arrived sitting in a small demitasse, which was filled with vegan escarole endive and asparagus velouté tableside. The coldness of the icy contents was tempered by the tepid, smooth soup whilst the barely bitter nettle-shiso-escarole combo was enlivened by equally lemony wild sorrel and melissa. 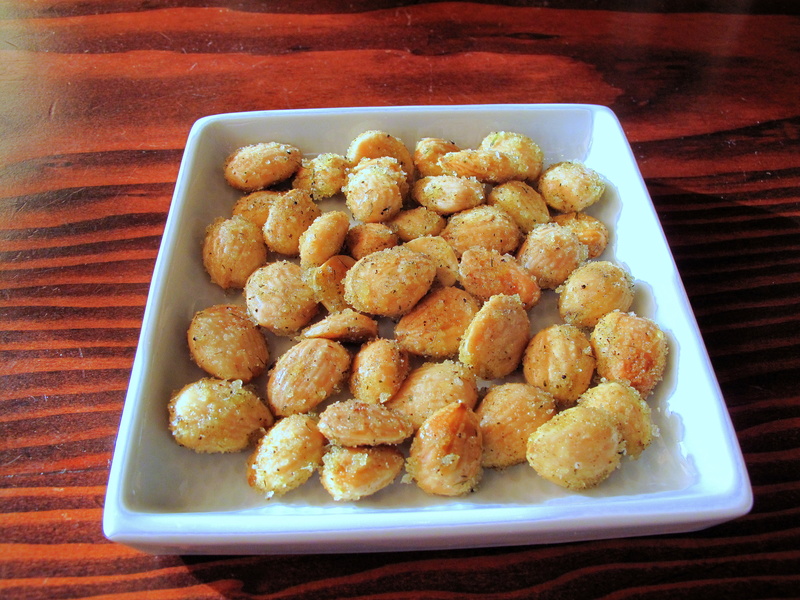 The signature toasted, milky Marcona almonds, laced with floral, sugary lavender and nicely seasoned, were addictive. Le Pain: Sliced baguette. The artisan Model Bakery, located literally around the corner from the restaurant, supplied the chewy-crusted, bouncy soft-centred baguette. The French butter, brought in a small clay bowl, was decent. 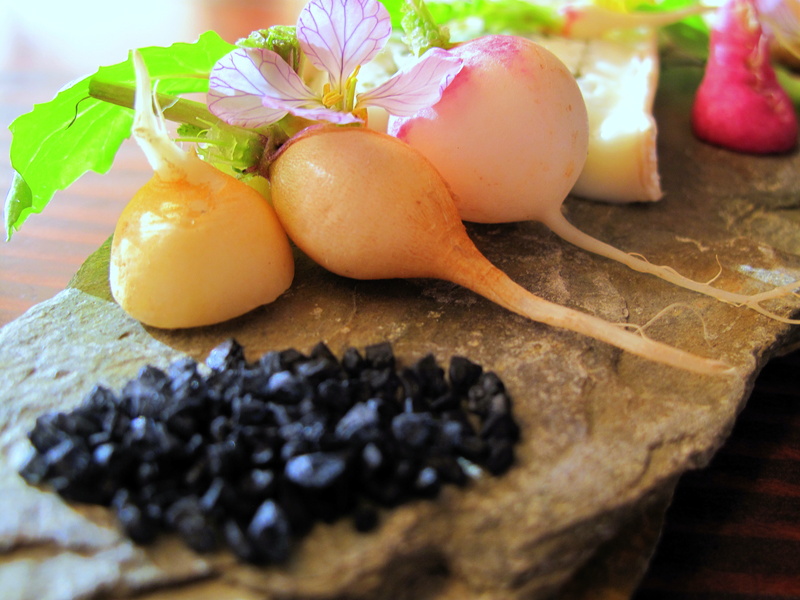 Entrée 1: REDHEAD RADISHES andante dairy’s minuet layered with nori, black salt. On one side of the ashen, asperous slate plate sat a cluster of black salt grains, on the other, three brindled beads of Dijon mustard vinaigrette were set; betwixt these two, a terrine of Andante Dairy’s goat’s cheese and nori came nestled amongst Easter egg and redhead radishes, their flowers and hong vit. The minuet – soft-ripened goat’s milk triple-crème enriched with cow’s milk crème fraîche – was unctuous with an interesting flavour imbued by the briny seaweed that lent the cheese an almost blue taste as well as aspect. The peppery, crisp radishes, still intact and as if just removed from the soil itself, accentuated the rustic, bucolic sense. Black salt, or kala namak, was mild and woody whilst the Dijon dressing, made with sweet-sour Banyuls vinegar, was strong and tasty. This was a brilliant dish with which to begin the meal. First, it was acutely evocative of not just the season, but the actual day – Easter Sunday. Ergo, the Easter egg radishes. This egg-y attention was then extended with the black salt, a condiment common in India, noted for a savour similar to hardboiled egg. Secondly, without saying too much too soon, it was the consummate introduction to Ubuntu – natural, informal, attentive, superficially rustic, intrinsically sophisticated and scrumptious whilst encompassing the chef’s nose-to-tail tenet. These ideas, which one will notice recur throughout the meal, will be developed further later. 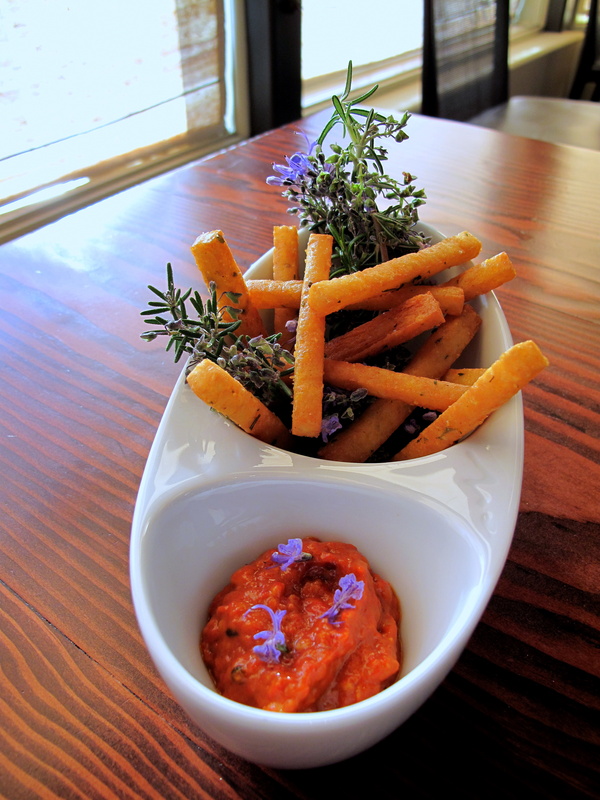 Entrée 2: chickpea fries with romesco sauce, flowering ROSEMARY. Skinny chips of chickpea, their amber crusts encrusted with green herbs, came burrowed between small branches of rosemary laden with bright, periwinkle blossoms and alongside just as vibrant, scarlet romesco. These vivid colours and the flavours that followed instantly suggested the Mediterranean. Subtly spicy, almost sweet Catalan sauce, made with Navarrian piquillo peppers, sherry vinegar and smoked paprika also had crunchy almonds and nice consistency. The fries, hot, crackly-crisp and stunningly clean, were excellent. Their mild nuttiness enlivened with parsley, garlic and rosemary. 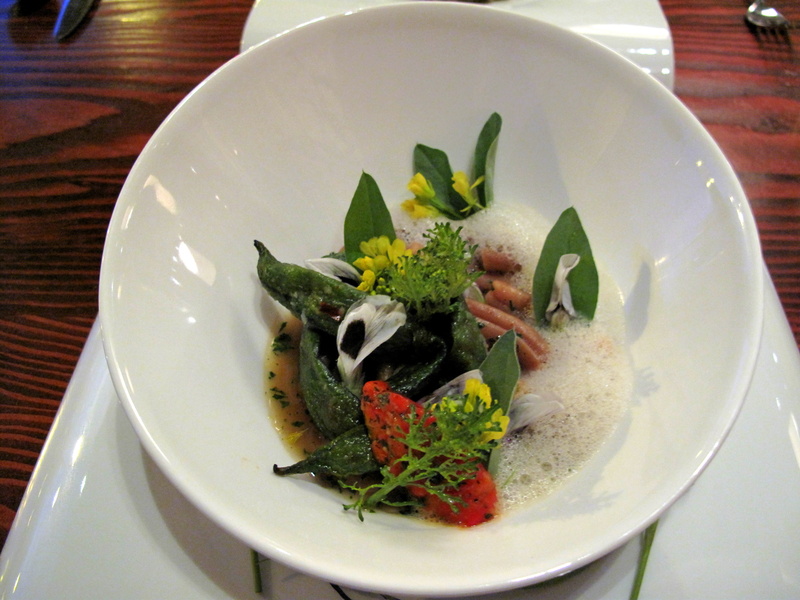 Entrée 3: 2X-shucked peas and GOLD SHOOTS in a consommé of the shells; White chocolate, CHOCOLATE MINT, macadamia. The image of an idyllic garden pond was mimicked by a pool composed of champagne vinegar suffused with consommé made from the shells of English peas that, having been shucked and skinned, floated atop as if water lily leaves whilst their golden shoots pretended to be bulrush, their rosy flower, a lotus and chocolate mint, canna petals; crumbled white chocolate and toasted macadamia littered the surface and a purple snap pea scaled the side of the bowl. The attention to detail was absolute with dark jade drips of mint oil, meticulously dabbed about the peas, feigning their watery reflections. Picture perfect, summoning the spirit to disturb this portrait was a serious test. But the reward was worth it. 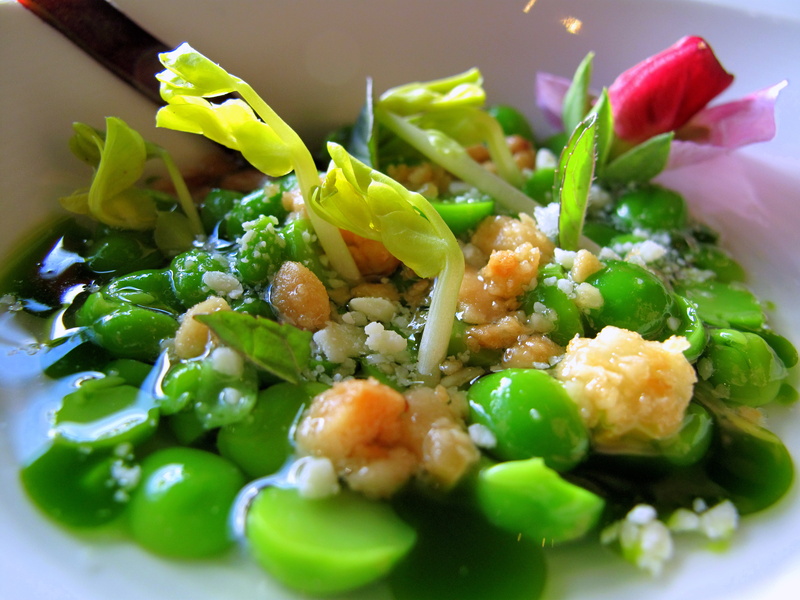 Garden peas, which maintained only the slightest crisp resistance before melting in the mouth, were served with their own shells, shoots and flowers that effectively intensified the vegetable’s inherent sweetness. The chocolate mint, underlined by the minty oil, played on the traditional partnership between peas and this herb, whilst introducing the faintest hint of coco. White chocolate, grated on top, accentuated the peas’ sweet savour still more and offered creamy depth with only the minimum of substance. Further, white chocolate’s classic kin, macadamia, seasoned the dish, adding brittle then buttery texture too. The light, gently acidic champagne vinegar – possessing a trace of vanilla also complementary to the chocolate – aided by a little lemon juice, invigorated and refreshed it all. Although an unexpected union of ingredients, the result looked, tasted and felt so true. Each flavour, distinct and precise yet in utter harmony, was integral to the piece. Each savour, singing a different note on the same chord, together proved a perfect chorus. 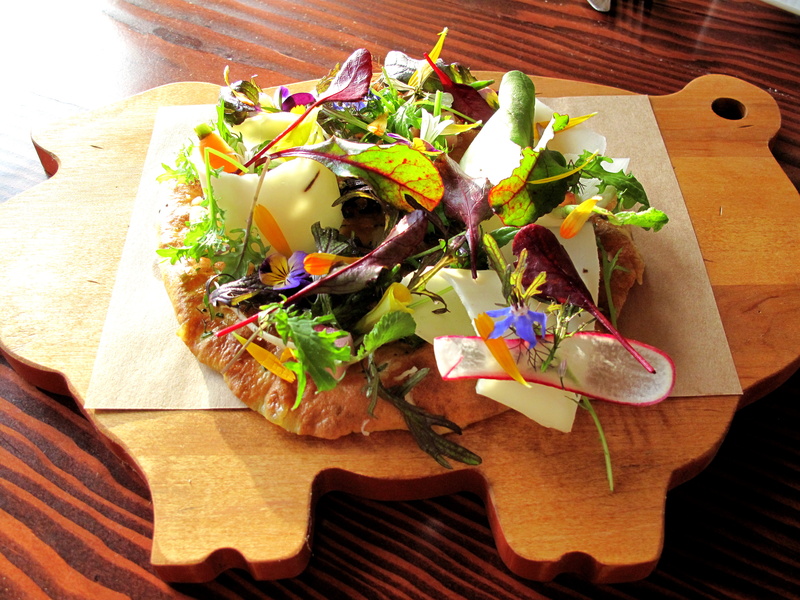 Entrée 4: carta da musica, our crispy sardinian flatbread; topped with the SPRING GARDEN, truffled pecorino. Upon a chunky cutting board crafted into the shape of a pig – with unabashed irony – rested a large, circular flatbread smothered with a colourful muddle of vegetables, flowers, leaves and stems intermingled with bright, white slivers of truffled pecorino and peppered with sea salt and Regina olive oil. 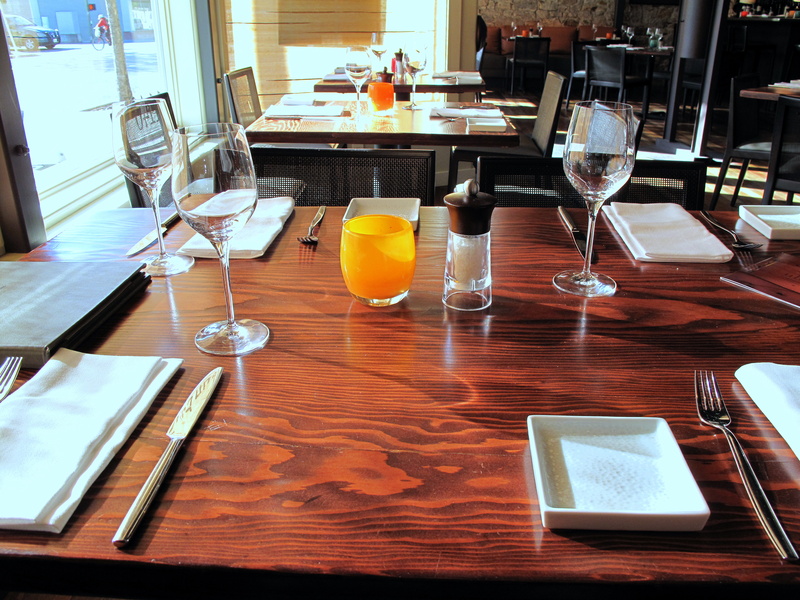 Cutlery was unnecessary as Fox encourages diners to literally break bread with one another. Carta da musica or pane carasau, is a Sardinian staple conceived of centuries ago by shepherds as their sustenance during months spent away from home. Essentially twice baked, as is the custom, red pepper and rosemary were also added to the dough giving the crackly bread some woody heat. This was complemented and contrasted by all that the garden had given that morning. Golden frill mustard, sylvetta rocket, mandolined ribbons of radish, chrysanthemums…brought their own warmth; Bordeaux spinach, borage blossoms, pansies, carrots…countered with some sweetness; whilst subtle yet conspicuous Taggiasca olive oil presented fruitiness. However, what really stood out here were the curls of Pecorino Toscano, studded with flecks of black truffle. Creamy, soft and nutty, it was also, and most remarkably, full of earthy, musky flavour. These were probably the most powerful truffles I had tasted all year. Entrée 5: roscoe’s asparagus, “virtual” egg infused with saffron; black trumpet and brioche terrine, SYLVETTA ARUGULA, preserved lemon. 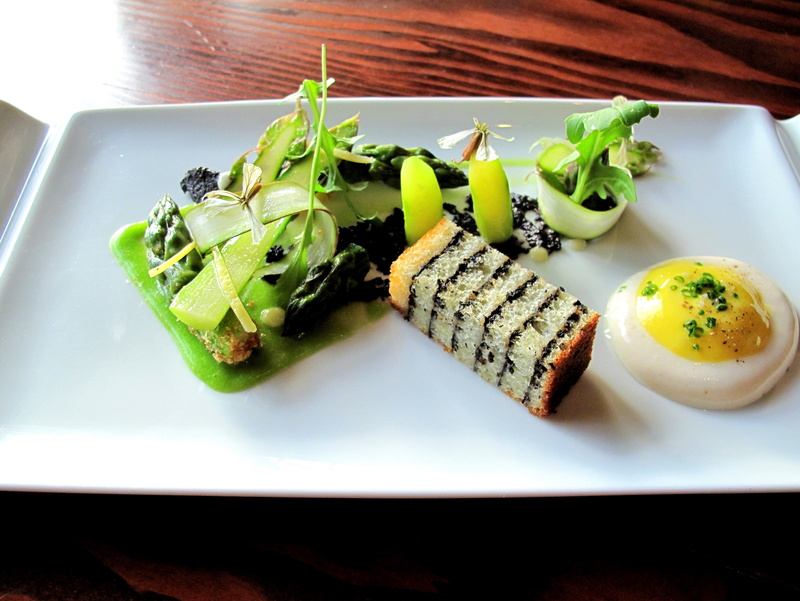 A trim smear of lemon-laced Sacramento Delta asparagus purée, embedded with various preparations of the same vegetable – whole tops with brioche crumb-coated bases, demi-spears, raw wafer-thin strips – preserved lemon rind, its coulis, sylvetta rocket and its flowers, faded into a trail of trompette de la mort caviar, itself implanted with similar elements as well as a brace of blanched asparagus pillars. Perpendicular to this lay a brick of Deanie’s brioche layered with more black trumpet and truffled pecorino besides an ersatz egg. A less-than-attentive eater may not actually notice that this is not a regular egg. Having been cooked sous vide, the white and yolk were separated then inserted, with xanthum gum, into separate whipped-cream canisters (with saffron also added to the yellow). The effect was an incredibly light, almost effervescent creation with all its original flavour plus a dash of spice. Being spring, egg had to be teamed with asparagus and thus the green had been incorporated raw, cooked, chopped, sliced, pureed and whole. 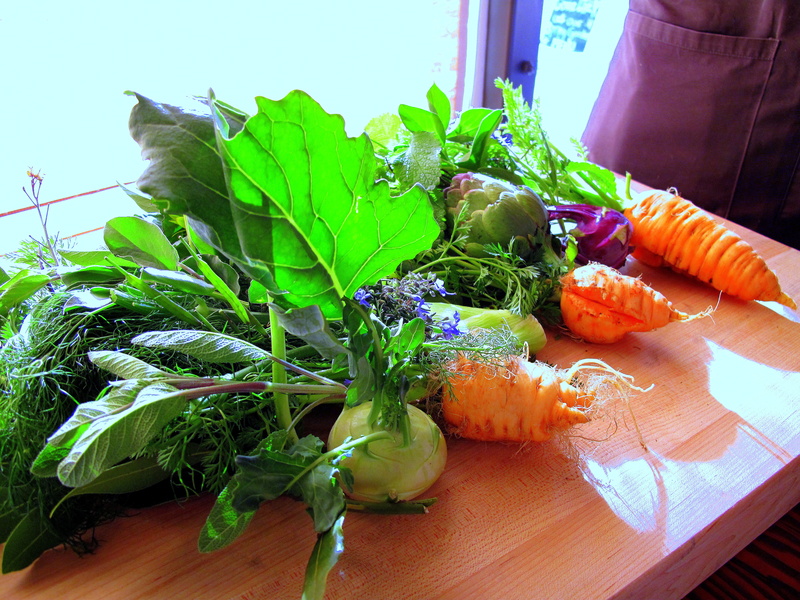 Supplied by Roscoe Zuckerman, a third generation farmer of this veg, it was sweet, tender and so fresh. The truffled cheese made a welcome return with the earthy mushroom in the soft brioche. Tart lemon was an agreeable touch. 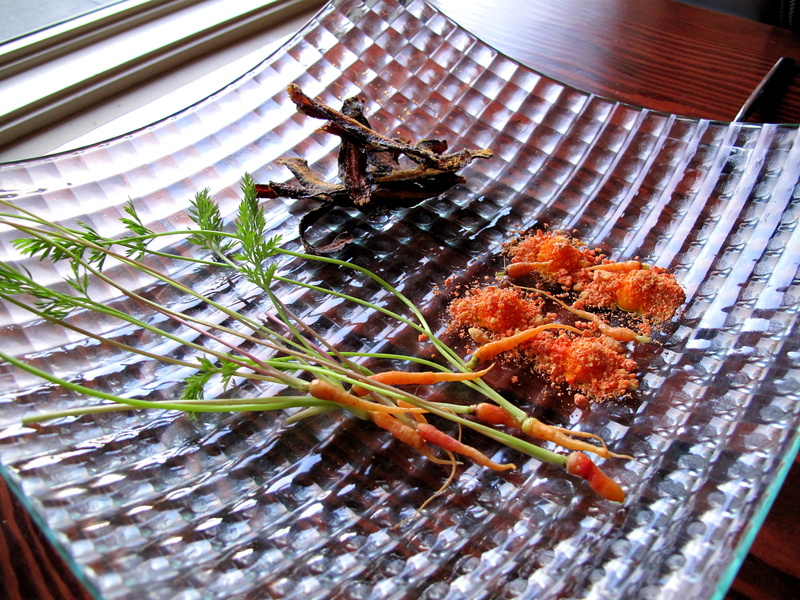 Purple tapas 1: ‘PURPLE HAZE’ CARROTS; raw with ‘carrot cake’ mousse, chips with mimolette powder. Purple haze carrots came in three forms – untouched baby roots, tops still attached; carrot crème coated in its own crumble; and sliced then fried with mimolette. The three heaps, although each composed of the entire carrot, each suggested just one particular portion of the vegetable as seen in its native environment; only together did they resemble a whole. The raw morsels, more stem than meat, symbolised the green blades that have burst out of the earth; the orange mousse, the taproot; and the dark chips, the soil. The tiny carrots were sweet and crunchy, the cream mild with cinnamon aftertaste whilst the fried, the most interesting, were nutty, sharp and caramelised. Although the mellow, nutlike mimolette went well with the carrot (their consonance uncovered by Fox by chance when attracted by the cheese’s matching colour whilst making gnocchi with this root…), the difficulty in eating the carrot cake mousse made this dish practically problematic. 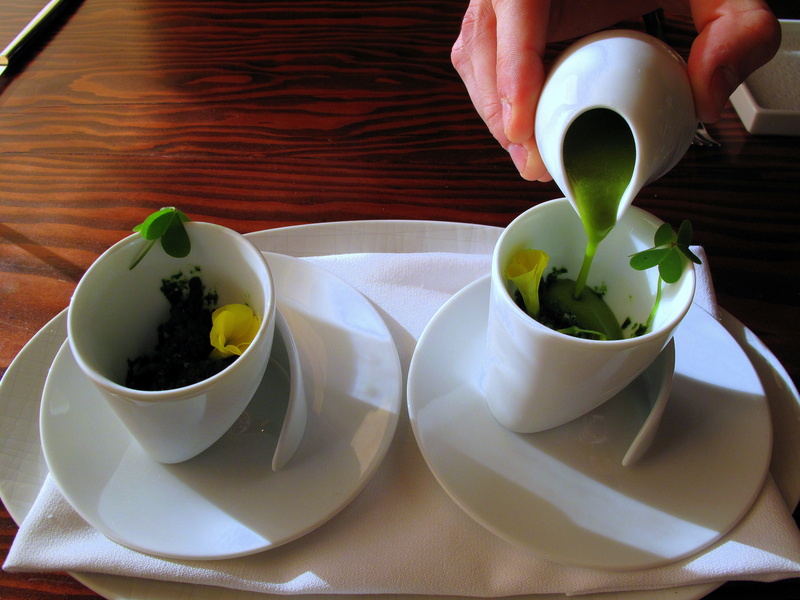 Purple tapas 2: ‘VIOLET QUEEN’ BROCCOLI a la catalan 2009; pine nut, soy milk, golden raisin. Marinated in sherry vinegar, a single head of purple sprouting broccoli, its myrtle buds streaked with maroon, was inset with golden raisins, pine nuts, pansies, mint and sitting atop soy milk pudding, which reappeared on either end of the plate as two crescents studded with the same nuts and raisins whilst petite tears of red pepper coulis bordered one side of it. The pudding was rich yet delicate and smooth with an intrinsic nutty note that resonated with the vinegar and toasted pignoli. These were joined by raisins, a classic counterpart to the latter around the world and nowhere less so than Catalonia, where this marriage is most commonly celebrated with espinacas a la Catalana. The broccoli, substituted in for spinach here, was a textural treat – the crunchy stems, the succulent sprouts – all underscored with a slight sweetness that was drawn out by the juicy, plump pasa. 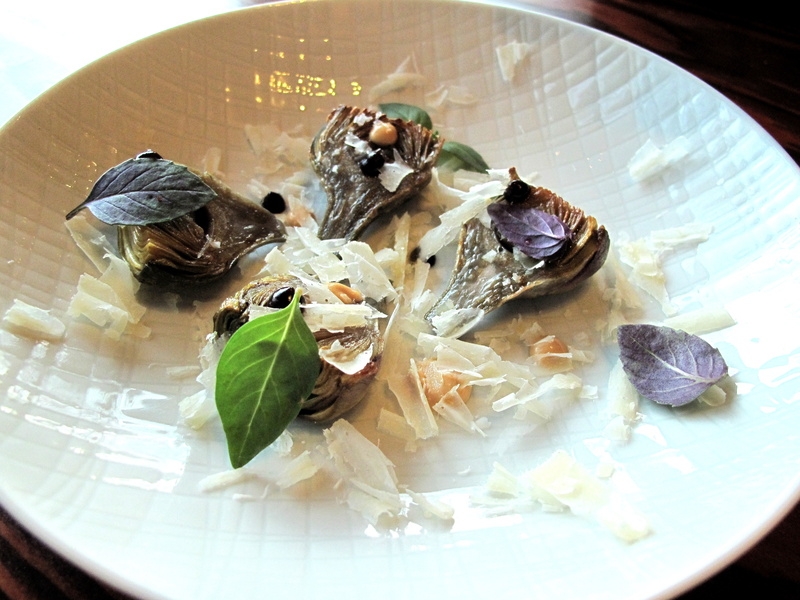 Purple tapas 3: ‘PURPLE VICIOUS’ ARTICHOKE confit miso “bagna cauda”, BASILS, black olive caramel. Two violet artichokes divided revealed veronese-viridian centres, ravelled down the stalk as if deliberately by gentle, edible thorns, and intricately crinkled buds, their leaves enfolded around each other, becoming paler and brighter, before returning to wisteria towards the final folds. Strewn over with alabaster scraps of parmesan, black (olive caramel) and beige (miso bagna cauda) beads as well as various basils ranging from amethyst to emerald, it was almost ethereal and as dramatically rustic as it was refined. The traditional anchovy element of this Italian sauce had been replaced by akamiso, whose strong nutty and salty savour made it a more than satisfactory substitute, whilst the customary Jerusalem artichoke and cardoon crudités were exchanged for their common cousin, the artichoke. The combination of this thistle with miso and the cheese provided plenty of umami and nuttiness. Purple tapas 4: ‘PURPLE VIENNA’ KOHLRABI “nose to tail” violet mustard and CHARD STEM dipping sauce. 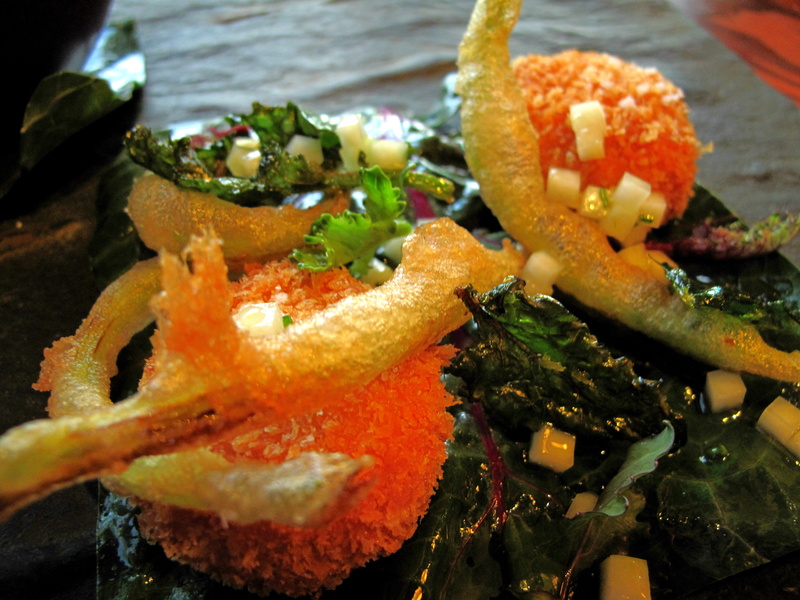 A kohlrabi leaf, neatly squared, bore its own bulb wrapped in panko and deep-fried; tempura of its stem; onion brunoise; and a splash of olive oil. Upon a second, identical blade, stood a bowl of chard stalk dipping sauce imbued with moutarde de violette and containing diced kohlrabi and baby basils. The stem was crackly then chewy, if a little oily. Clean, crunchy and salty, the bulb was much better. The sauce was delicious. Made with violet mustard (one of my favourite condiments) – a mixture of black grape, mustard seed, wine vinegar and spices such as cinnamon and clove invented in thirteenth century Périgord that fell into fashion during the Belle Époque, but then fell out again – it was corse yet creamy, sweet yet tangy. Pasta 1: our toasted BRONZE FENNEL casarecce pasta; whole FAVA PODS with their LEAVES and FLOWERS, pepper ‘tears’. Shallow pepper consommé surrounded fried fava pods on one side of the dish and short twills of bronze fennel and farro pasta, blanketed by its on emulsion, on the other. Over both, upright broad-bean blades and black-and-white blossoms, fennel fronds and its yellow flowers, plus rich red roasted pepper paste, were precisely positioned. The casarecce were light with nice, nearly nutty-sweet flavour whilst the flavoursome pods were very interesting and incidentally not dissimilar to al dente pasta. The broth beneath was mildly spicy and the various foliage, invitingly aromatic. 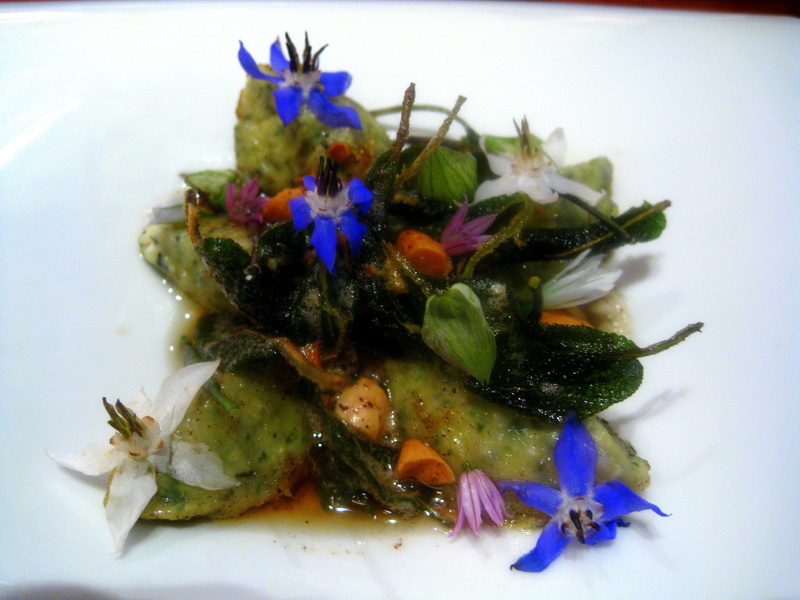 Pasta 2: BORAGE gnudi with brown butter and flowering SAGE; Shoots and seed pods of HON TSAI TAI: a red Chinese brassica. A quintet of gnudi quenelles, sat on a bed of hon tsai tai in beurre noisette, came scattered with a fragrant, colourful clutter of sage leaves, its pink and purple flowers, white and blue borage ones, hon tsai tai pods and crushed macadamias and almonds. Ricotta and borage blended together to form warm, moussy dumplings that were simply comforting to eat; the herb’s bright blossoms bettered its delicate flavour. The brown butter was rich, but cut by the lemony sage and sweet-mustard savour of the hon tasi tai. Nutty crumbs complemented with their crunch. 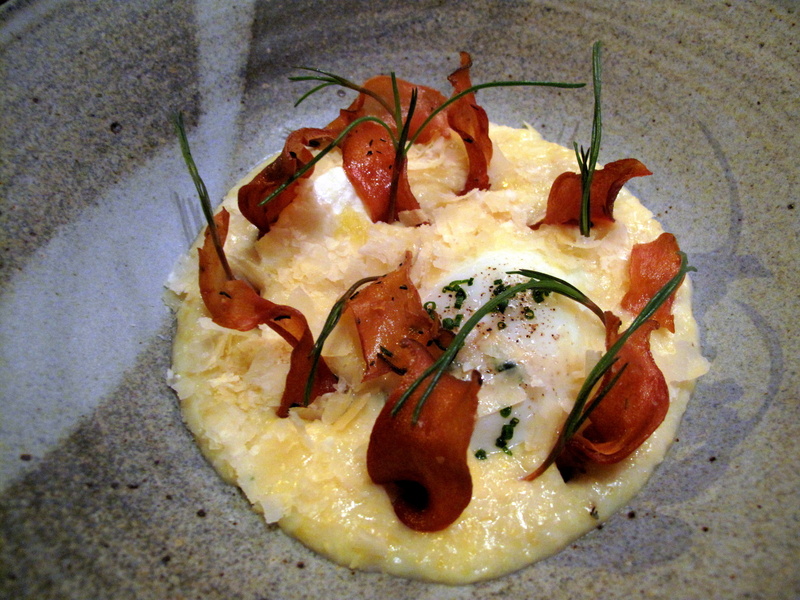 Pasta 3: yellow corn grits from Arbuckle with a slow egg; our goat’s milk ricotta and whey, AGRETTI, trumpet chips with SAVORY. Yellow grits are coarsely ground whole corn kernels that have been slowly simmered down like porridge. 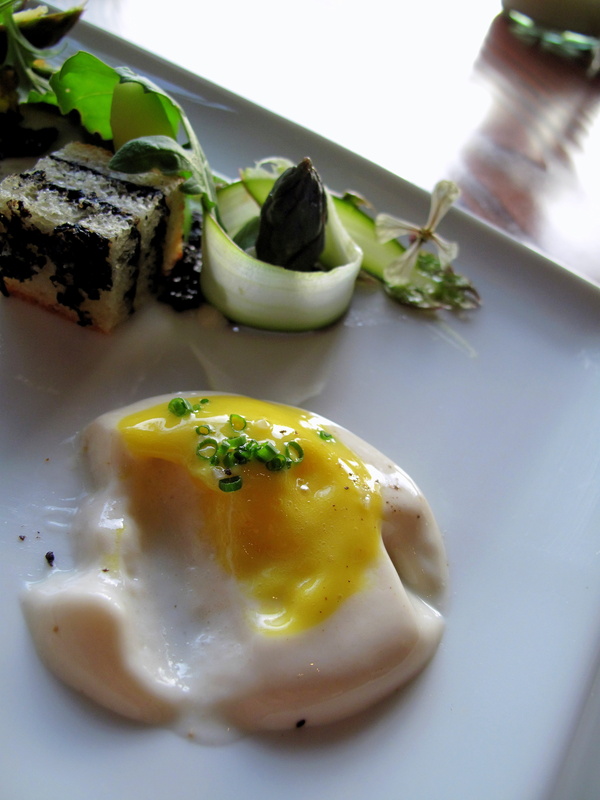 Fox mixes this resulting mealy paste with goat’s milk ricotta and whey, before plating it around a slow-cooked egg, nearly completely camouflaging it. Upstanding sprigs of agretti, as if growing from the grits evoked a moor scene; this sentiment consolidated by the damp-loving black trumpet chips and the sour whey (moorlands being characterised by acidic soils). Or, alternatively, it could just as easily have been a play on Southern-style big breakfast – grits, streaky bacon (mushroom chips) and fried egg. Sourced from nearby Arbuckle, where it is custom-milled for Ubuntu by Matthew and Erin Sweet, the corn was grainy and syrupy, flavoured mainly by the ricotta and parmesan. The egg added a richness that was balanced by tangy, salty agretti. As we ate, Marty Cattaneo, chef de cuisine, came over. As if we seemed in need of further proof of the ingredients’ freshness, he mentioned how, the kitchen running low on radishes, he himself was at the garden picking the very vegetables we had enjoyed only plates earlier. However we felt before he had arrived, we were certainly convinced by the time he left. Pasta 4: pane frattau: interpretation of a Sardinian classic; slow-scrambled egg, three FENNELS, strawberry soffrito, “music paper”. Pane carasau, the foundation of many of this island’s dishes, is indeed incorporated in pane frattau, which is loosely a lasagne wherein this flatbread, first softened, separates layers of egg, tomato sauce and pecorino that are baked together. Here, roasted fennel, resting in strawberry sofrito, is split into two and separated by scrambled egg embedded with torn pieces of this music paper. 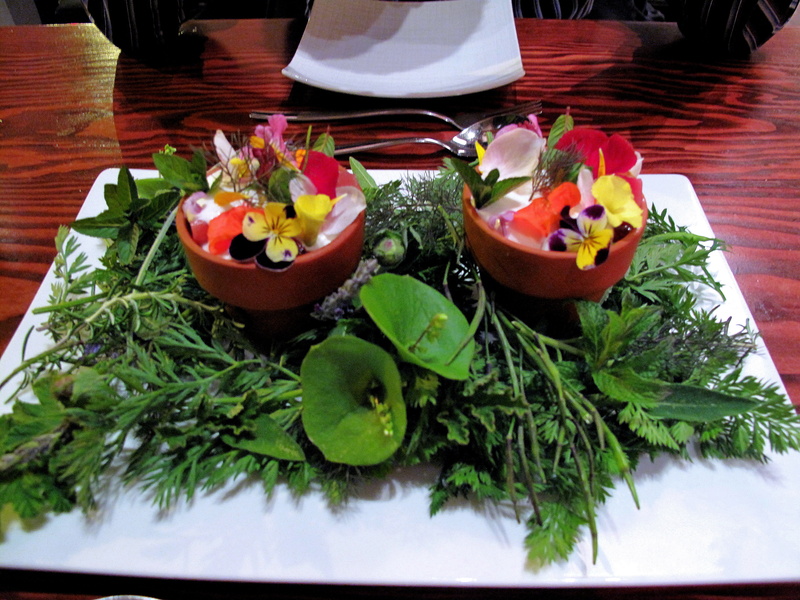 Along the rim, three cross-sections from the top half of the vegetable are dressed, like the bisected bulb, with its fronds and bright red and blond nasturtium blossoms. Spanish sofrito calls for tomato, but Fox, believing, as David Kinch does, in the affinity between that fruit and strawberry, cooks these berries for three days with garlic and onions, to create this punchy, sweet sauce. The egg was satisfyingly creamy and contrasted by the crisp chips. 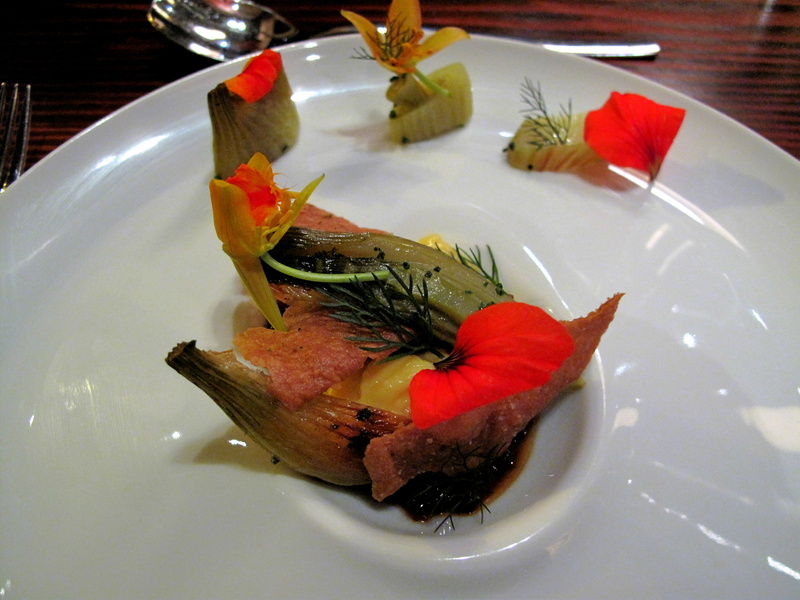 Nasturtiums were pleasantly peppery, but the fennel’s texture was somewhat soggy – somewhere in between crunchy and confit. 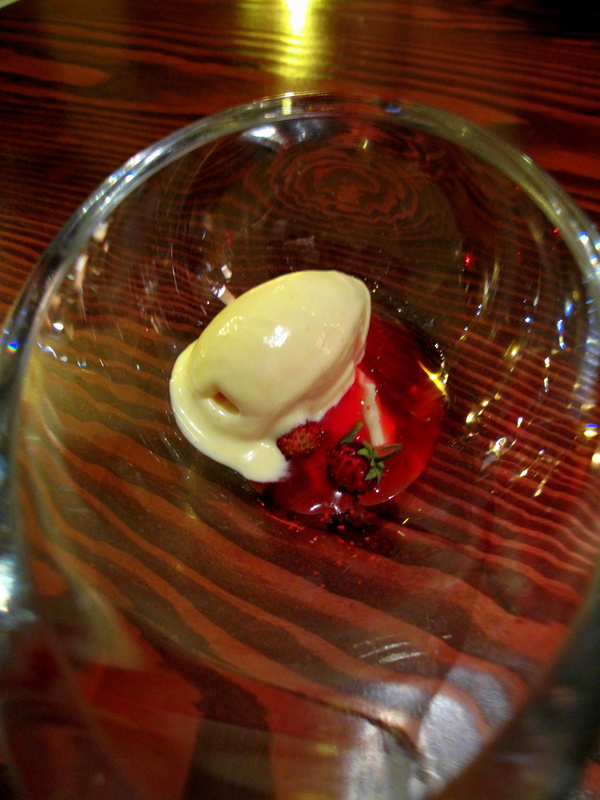 Dessert 1: brioche ice cream; buttermilk doughnuts, ALPINE STRAWBERRIES, strawberry consommé. 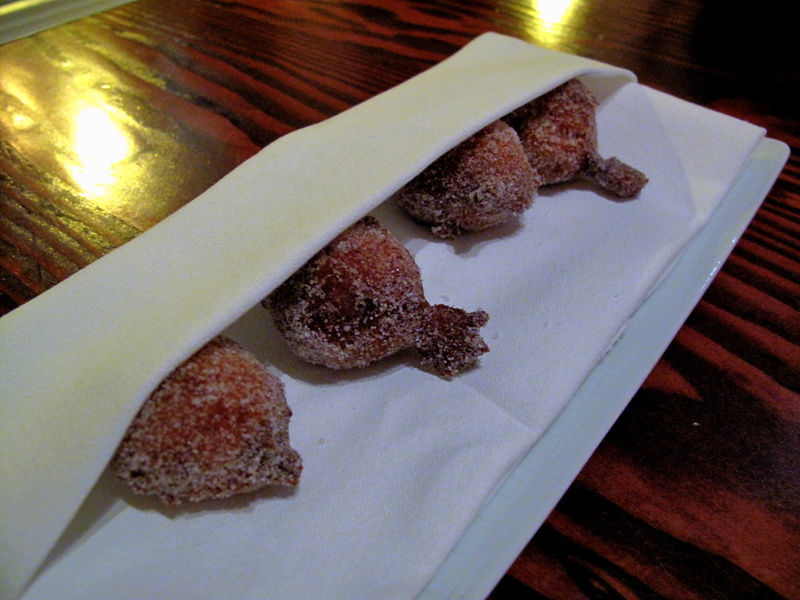 Four plump little doughnuts, dusted in vanilla, cinnamon and sugar, tucked up in a napkin to prevent them from feeling cold, were partnered by alpine strawberries served in condensed cream with a scoop of brioche ice cream, over which, strawberry consommé was poured. Unsurprisingly, strawberries and cream suited one another very well – the precious frais de bois bursting with flavour – whilst the brioche ice cream was thick and tasty. Pineapple-like doughnuts or, more accurately, ‘doughnut holes’, were excellently fried, very light and full of vanilla. 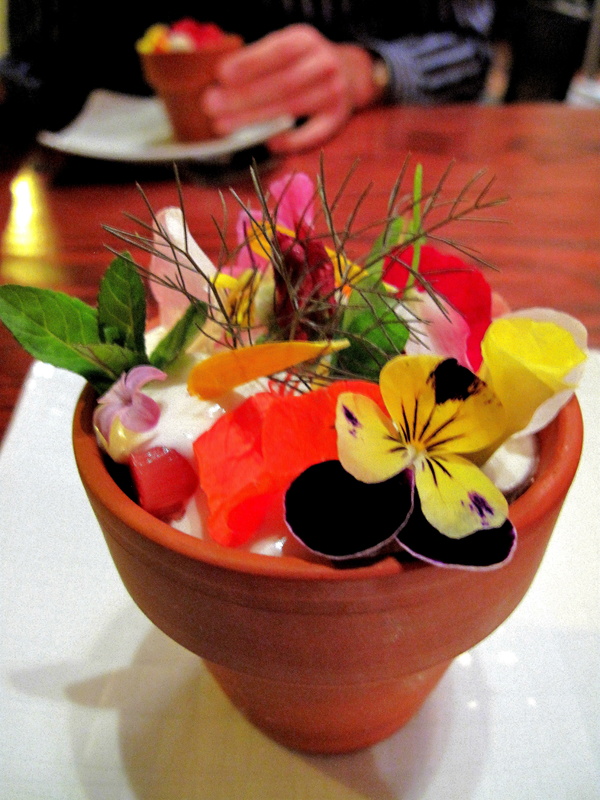 Dessert 2: the spring FLOWER POT; LAVENDER ‘cheesecake”, bee pollen crumble, rhubarb, meyer lemon. A large tray teeming with lush foliage was laid before us. Nestled amongst these fresh leaves, twigs and sprigs were two terracotta flower pots, themselves almost overflowing, crammed as they were with blossoms every colour of the rainbow. It was beautiful. So beautiful. The lavender custard that crowned the contents could just about be seen through the florid spray of inflorescence, efflorescence and even simple flowers too. Plunging the spade spoon into the pot revealed on its removal sticks of rhubarb concealed under the surface. That first spoonful, full of floral, citrusy lavender, along with random calendula, mint and even viola, was deliciously spicy sweet. 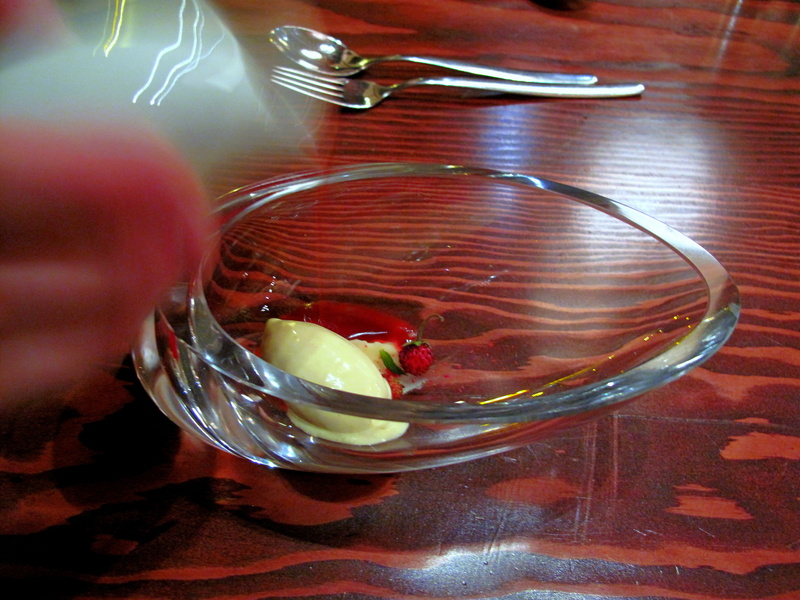 A second dip discovered bee pollen crumble beneath the rhubarb and, even further down, Meyer lemon mousse. Each subsequent scoop bore savours some mix of herby, creamy, sugary, sharp, crunchy, liquorice and peppery in promiscuous measure. There was perfect balance between the sweet cheesecake, tart rhubarb and sour lemon, whose twang lingered faintly after each bite. Petit Fours: mini vegan carrot cupcakes; “cream cheese” frosting, tiny candied CARROTS. 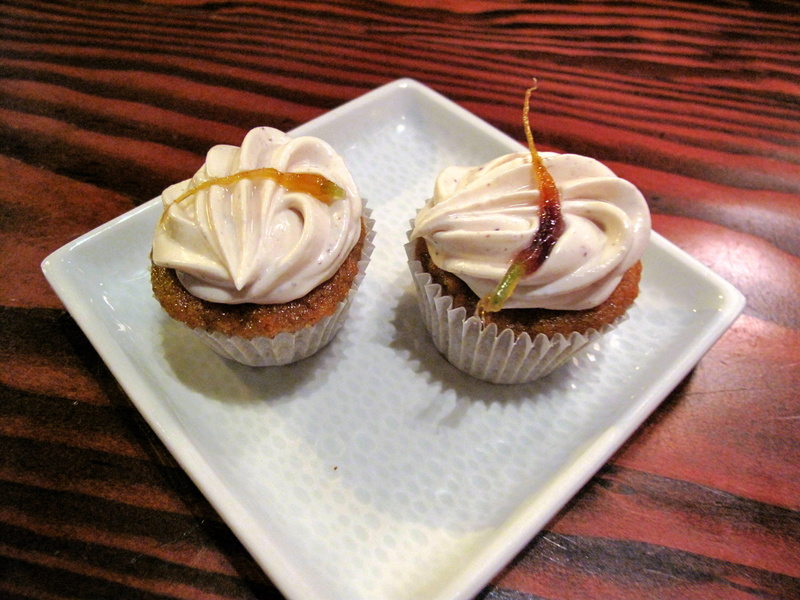 To end the evening, little carrot cupcakes, topped with soy cream cheese and confit baby carrots were presented. Moist and succulent, they were dotted with very sweet raisins whose intensity was assuaged by the dense vanilla cream. The REDHEAD RADISHES, as said, were a revealing beginning. Carefully constructed (physically and by design) and deceptively simple, this deconstructed rustic French salad was an easy initiation to Ubuntu’s unique style. It was followed by perhaps the finest fries I have ever tried. 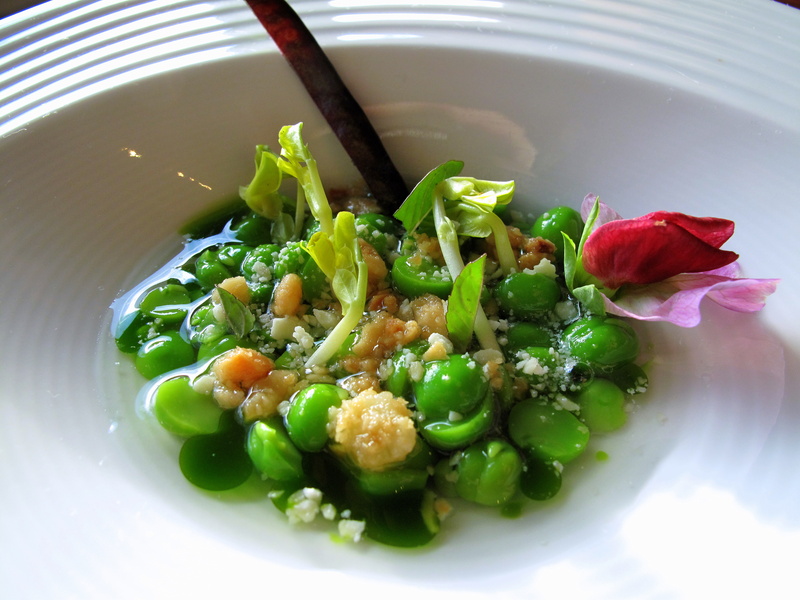 2X-shucked peas and GOLD SHOOTS, which Jean-Georges Vongerichten declares ‘the tiniest peas I’ve ever seen in my life…spring on a plate’, has become somewhat of a signature here – and justifiably so; this subtle dish was quite outstanding. The carta da musica is another ever-present, but less loved than the last course. What others have criticised however, I would rather compliment. Some have branded it impractical and untidy, but I did not mind the resulting clutter; in fact, I welcomed it. Of the tapas that came next, elements stood out, such as the miso “bagna cauda” and KOHLRABI “nose to tail”, but these courses did not reach the high standard set by the first few. The same comment can be made about the pasta, bar the BORAGE gnudi. This really was delicious. The arrival of the spring FLOWER POT was a special moment. At first, one is unsure quite how to approach it, how to eat it…if they can even eat it. The indecision lasts mere moments though – and after my first hesitant taste, I was quite ready to rip my shirt off and leap into the little jar. It was indeed a comprehensive menu and not every course was a sensation, but even these – into which category I would group the ‘PURPLE HAZE’ CARROTS, yellow corn grits and pane frattau – were simply weaker than others rather than disagreeable in themselves. On the other hand, I thought all the entrées a success and, more specifically, I would select 2X-shucked peas and GOLD SHOOTS, BORAGE gnudi and the spring FLOWER POT as my favourites; and I am glad to be able to (deservedly) include creations by both Mr. Fox and Mrs. Fox in that roll. The quality of these dishes – the best dishes – was tremendous. The first, conceptually was intoxicating; its taste at once recognisable and yet completely new. 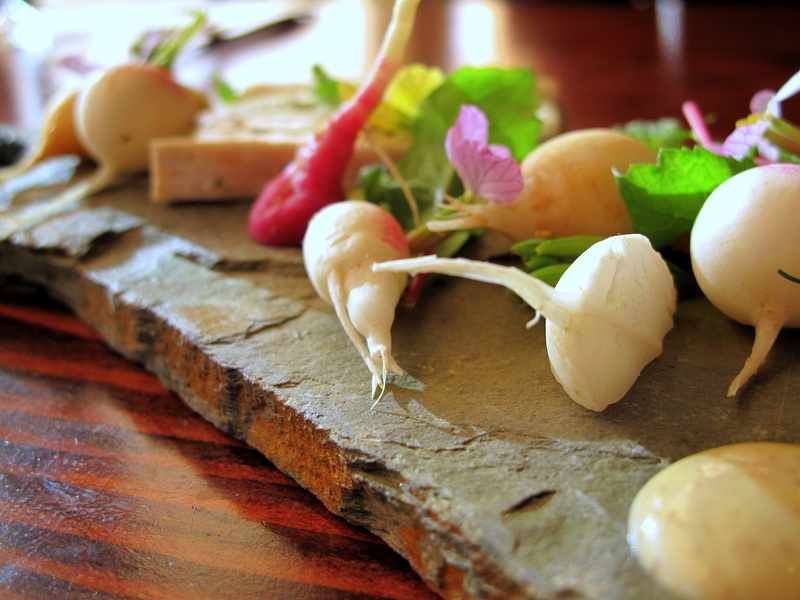 The gnudi were a gratifyingly good way of showing how simply the garden can improve classic recipes. The last was bliss. What impressed me most may have been how evolved I found the restaurant. By that I mean, how articulate the cooking was, how good it could be and how concentrated, orchestrated and concerted the enduring effect or impact it left. ‘A celebration of vegetable-inspired cuisine’ – this simple statement is Ubuntu’s leitmotif and this ideology is infused into and effuses out of all that one finds and feels therein. Once one enters and takes their seat, it is actually the space and the service, not Fox’s food, that gives the diner a first taste of what will come. Ubuntu is as modern and urbane as it is classic and comfortable. The sounding kitchen sets the tone, which is accentuated by the chitter chatter of diners, the clitter clatter of their cutlery and crockery – there is activity here. There is energy. As the restaurant revolves around the freshness of its ingredients and vitality of its garden, it is only natural that this vigour extends to the whole experience. Staff are animated and engaging. They are friendly, keen and very capable. Our principal serveuse, Mitsy, stood out with her consideration, considerable patience and thorough knowledge; she even managed to maintain her smile throughout the entire (six hours plus) evening. Fundamentally there is a cardinal deference for the season, but beyond this, it is in the little details that the produce can be seen to be esteemed most and treated most meticulously. Fox has confidence enough – faith enough – to serve radishes raw, untouched, straight from the soil: ‘it can take me two hours to clean thirty radishes. I look at them like jewels.’ His time at St John taught him all about ‘head-to-tail’, his pig dinners at Manresa expounded this education and all these lessons have not been forgotten here. ‘Before Ubuntu, I was really into pigs. I’d see the animal and think of what I’d do with all the different parts. 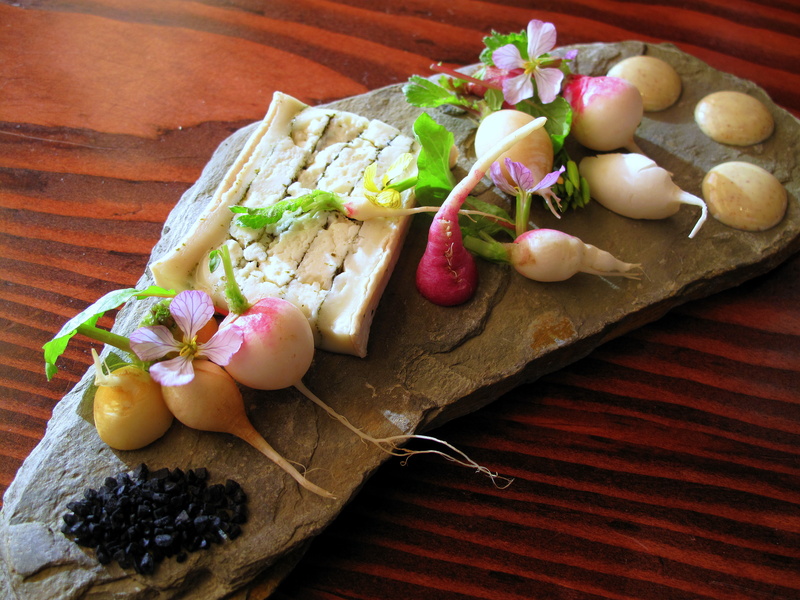 Now I look at kohlrabi that same way.’ Those same radishes are served entire, their roots and stems still intact. The chef is always eager to utilise all elements of the vegetable, from root to tip – remember the carrots, recall the asparagus and of course the kohlrabi. Fox applies a primitive and provocative aesthetic to dishes that is also really very attractive. Colour is possibly his most basic cosmetic. Bright, vibrant shades instantly make anything more appealing whilst simultaneously also suggesting life. Its effect is also one consequential to and causal of the already outlined flower-to-root point above and, accordingly, it is achieved organically through the flourishes of blossoms, herbs and micro-greens that decorate and substantiate plates. Imitation, it is said, is the sincerest form of flattery. Thus is the chef’s cooking again complimentary to its source. Another, far more subtle, although perhaps far more poignant, way in which he plates is inspired by real life, by Napa’s surrounding scenery. In several dishes does he evoke the native landscape from which he derives his ingredients: ponds, marshes, the soil and even the window sill are all given appreciative recognition. 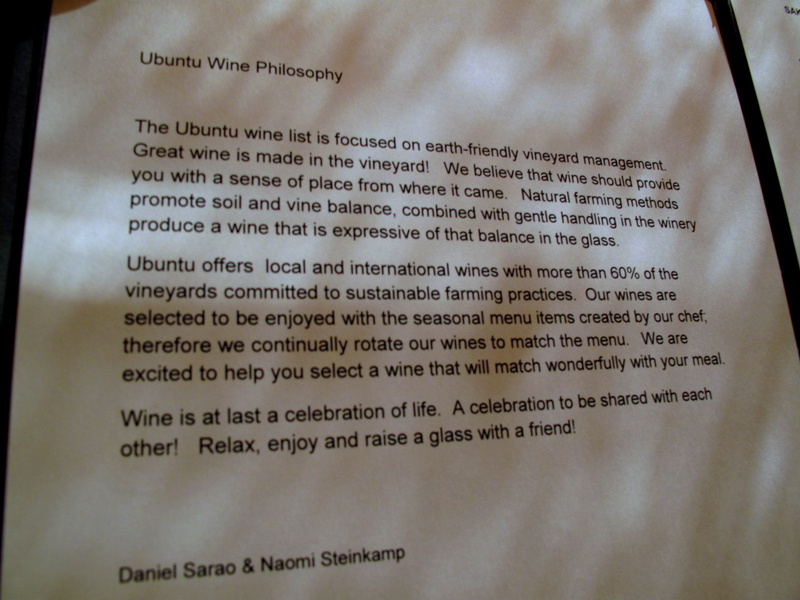 Dining at Ubuntu is definitely fun. The already discussed flowers are again influential – frequently given as gifts on special occasions – these are symbolic of celebration. Therefore the flora here, signifying freshness with its alluring hues, also adds festivity. There is also the inviting informality that is intensified by such courses as the carta da music, when guests, as mentioned, break bread together. On several occasions, Fox encourages diners to get their hands dirty, literally – and indeed, eating with one’s hands is a challenging and clever concept, which engages the guest and makes the experience an interactive one. With it comes the simple gratification endemic to breaking any social taboo; then there is the joy of satisfying a primal urge in a primitive manner that comes before the self-deprecating giggle let loose when one imagines what others watching could be thinking. It is nearly needless to list that last thrill inherent with leaving a mess (that another must tidy). There is a terrific invention and reinvention to be discovered here. Many of Fox’s recipes are rooted in Spanish and Italian tradition, but all refreshed in interesting and toothsome ways. 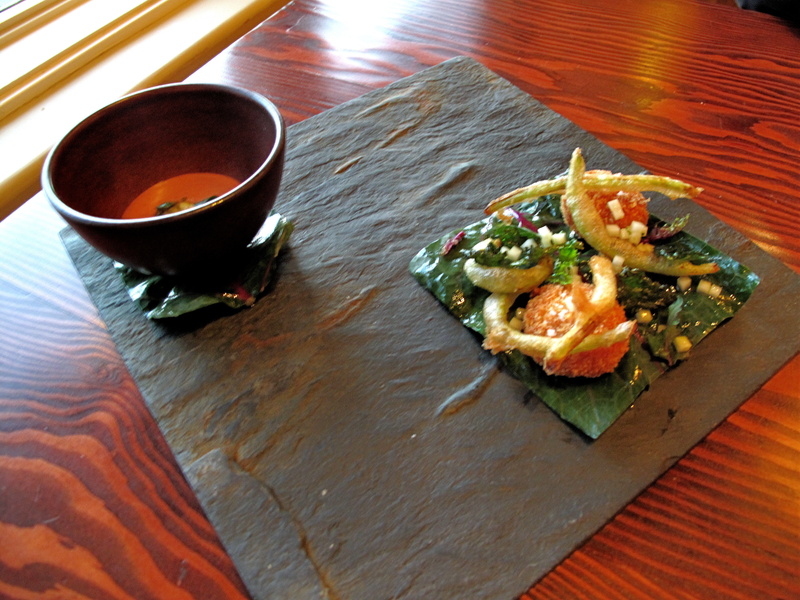 Today, for instance, we sampled sofritto of strawberry and bagna cauda with akamiso for anchovy, but the chef’s creativity stretches to a whole range of other dishes that draw on his butchery past, although none of these featured during this meal. Controversially maybe, he offers such courses as an almost meat-mocking whole-roasted OXHEART CARROT stuffed with satsumas or a ‘BLOOD SAUSAGE’ slider – a mini burger built around a beetroot patty with Italian black rice, radishes, onion apple and sweet spices. In fact, the chef actually entered his vegan rendition into the hamburger contest at the South Beach Wine & Food Festival earlier this year (although he was informed he could not win the (meat-producing) sponsor’s award). It is not unusual for vegetable-focused restaurants to include plates like these and I for one do not object to them – as long as they are done well. At Ubuntu especially, it is no surprise to see the chef wanting to show off the skills he was once celebrated for. Where Fox does draw the line though are stereotypically vegetarian foods like tofu, seitan and brown rice. Ubuntu excites. The cooking here seems to be constantly evolving and evolving swiftly. Looking at dishes, speaking to others, the progress is patent. It is not just a case of new recipes being developed, but of old ones always being improved too. The garden is contributing more and more and it is seems to be inspiring Fox. Moreover, its infectious effects appear to have spread to the entire kitchen: having spoken briefly to both Marty Cattaneo and later, sous, Aaron London, we were struck by their enthusiasm, curiosity and excitement. It is important to note that, even though I have made much of the innovation, the mental stimulation and evocative physical presentation of dishes, there was still felt to be another focus superseding all this – one on satisfaction. Everything done was directed at elevating one’s eating pleasure and the eating experience. I have deliberately avoided any material discussion over the fact that this is a cuisine devoid of meats/seafood, not wishing to waste words on the merits or shortcomings of such. I only mention it now, with the hope of reminding any readers who are in need of it that when cooking is this thought-through, this pristine and this tasty, it is easy to enjoy just as it is. At the evening’s end, having just devoured our desserts, we were immediately depressed: we did not want dinner to finish. Mustering sufficient nerve, I was volunteered to ask the chef for more. But alas, the kitchen had, unsurprisingly given the late hour, already closed. However, in hindsight, it was actually a rather fitting finale. 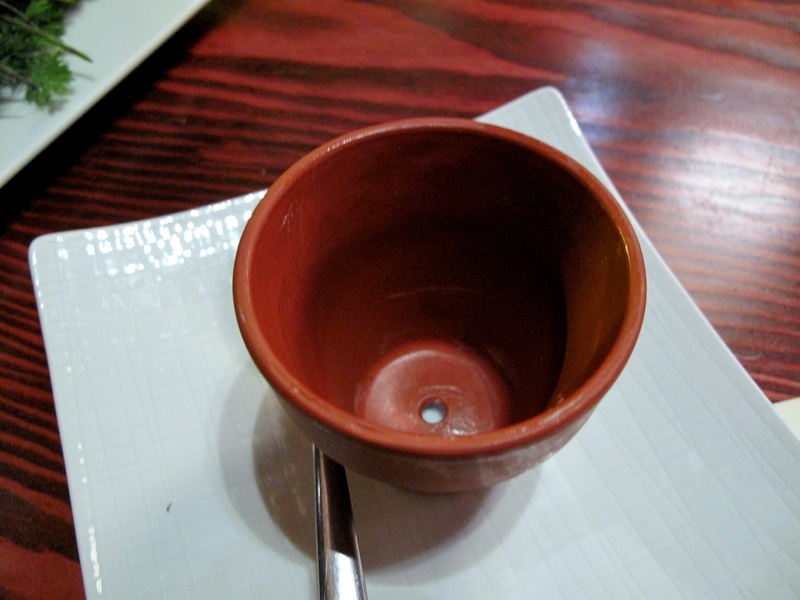 After all, is not the hallmark of a great restaurant to leave you wanting more? So what restaurant did you prefer Ubuntu or Manresa, P.S it makes you wonder if chef Jeremy Fox he can make the food taste that good with one arm tied behind his back, what could he do with fish and meat if he had the choice. I think you might eat more than you write! 🙂 (and you may have had one or two dishes I did not try over 3 visits in Spring!) 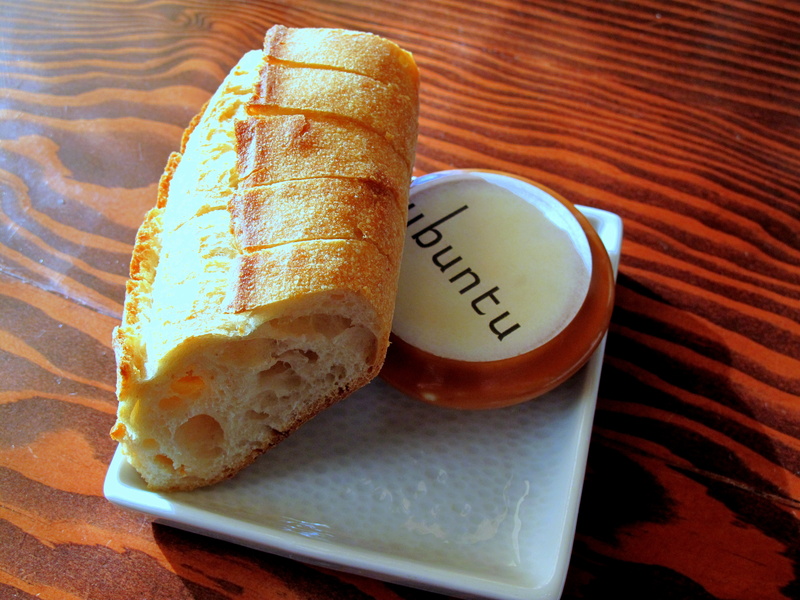 I did not intend to start an ubuntu meat-mocking meme but it is interesting to hear other’s POVs. I would have thought the hallmark of a great restaurant would be to leave you feeling satisfied, actually! As regards your initial query, I have to say ‘they are very different’. I like both a lot, but at Manresa I could barely fault a dish and I was blown away by Kinch’s thoroughness and versatility. 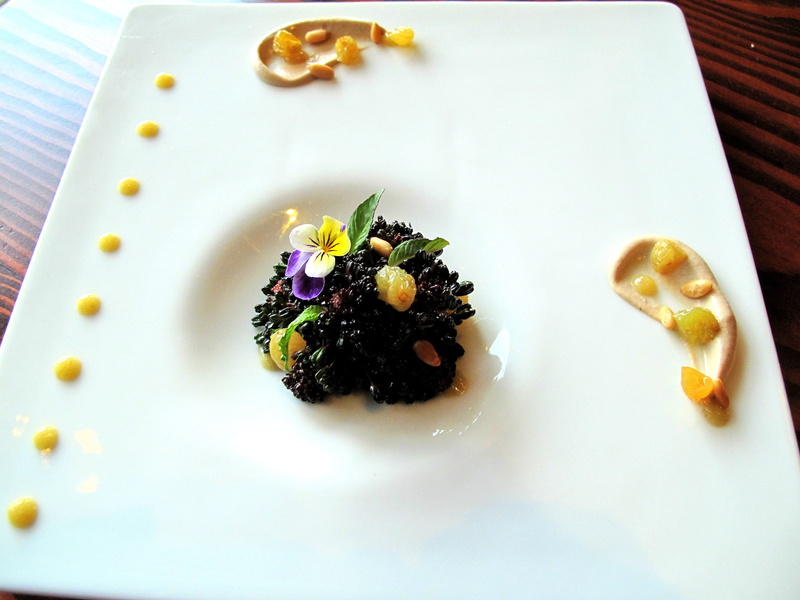 At Ubuntu, some of the dishes were simply stunners, but some were only alright. Thus (and speaking to friends who have dined there after I did and found the same dishes improved), I think the potential here is immense. I could not return to either without visiting the other too. A: Are you kidding? Allow an editor near my precious opera!! C: Confession – the tapas were shared and we switched half-way with the pastas! But still…it was plenty. And I would not have needed to write as much had Jeremy not fed us So much. O: 🙂 I thought my meaning was clear, apologies: we were quite (physically) satisfied, but we are not sensible people. We were enjoying the food and enjoying ourselves so much (that sounds dodgy) that we did not want to go home and wanted to try more dishes. Completely indulgent behaviour, I know! Oh I see. With you now. Looks like a beautiful meal, anyway. Do you think the same concept could work in Britain or would the haute-veggie thing only carry in California? The thing about Ubuntu is that I do not consider it a veggie restaurant. I guess this is down to the quality of the chef; the food is good enough to be appreciated for what it is, one does not feel they are missing out on anything. I suppose then it comes down to the question, how many chefs are there here as good as Jeremy Fox and are they willing to try what is essentially, at least in Britain, a risky concept? The closest we have to this approach is Stephen Harris (another rather good chef, by the way). His ingredients are all immediately local and it is one of the reasons I like the Sportsman so much. Admittedly, he is not vegetable focused, but he does have his own garden now, so I expect this to become more influential on the menu with time. Come to think of it, maybe l’Enclume grows its own too, but I am not certain of this? However, if we are just talking about vegetables specifically and solely, the real problem for most chefs would be, I think, the quality of ingredients. California is amazing in that respect and even Jeremy Fox has stated that this concept would not work in most other parts of the country as the weather would not be good enough for the garden to be able to support the restaurant. 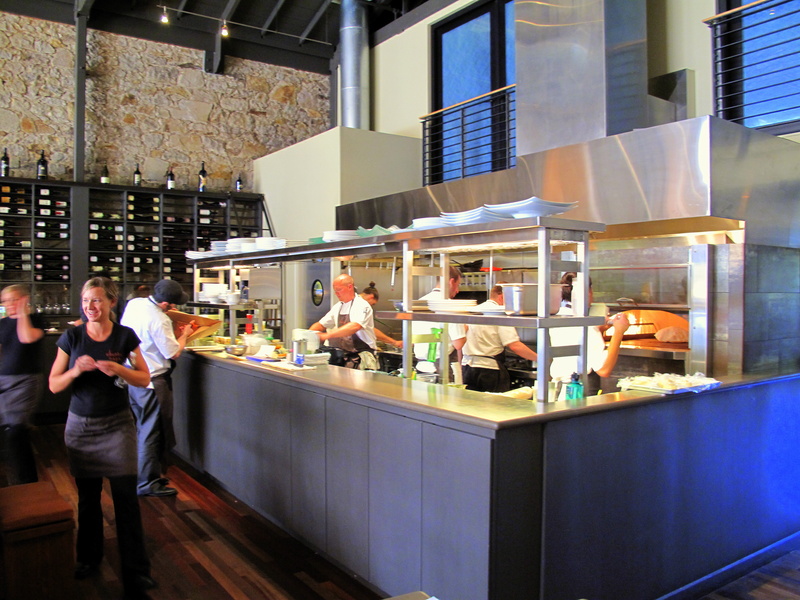 The only place, outside California, that I can name that does manage it to note is Blue Hill @ Stone Barns in NY. VEGGIEGASM! 😀 That was a wonderful review, the tastes and details of the dishes leapt off the page just like the beautiful colours of the food leapt from the photos. On the subject of vegetarian restaurants in Britain, there is a relatively haute cuisine all-veggie restaurant in my hometown of Edinburgh, called David Bann’s. Doubt it’s up to these kind of standards, but I’ve had some very good food there. 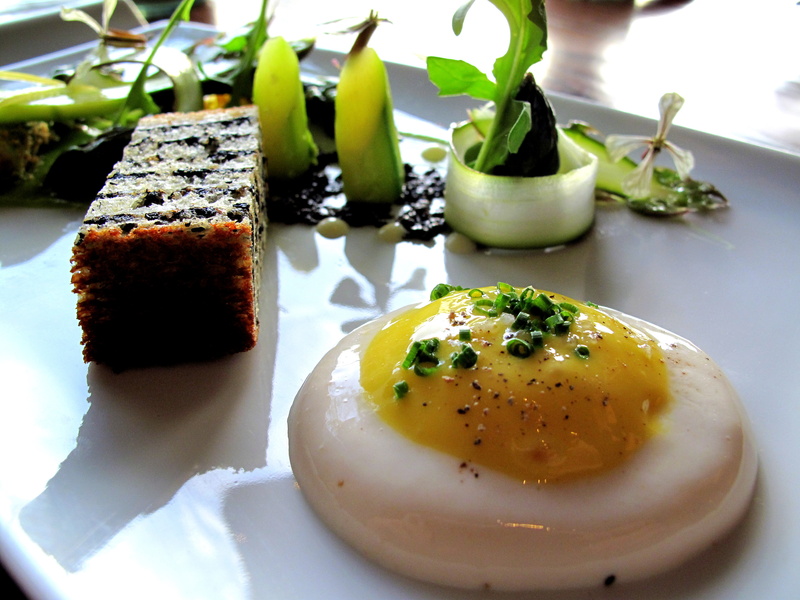 Edinburgh is actually something of a veggie heaven, possessing several other specialist vegetarian places. Indeed, for its size it has a large number of good restaurants in general (I believe there are three one-Michelin-star places now, one of which I’ve been to on a special occasion) – I’ve been known to say that there are more places to eat in Edinburgh than there are people! Cheers, Keith, for the comment and kind words. Indeed, now I remember that you are a vegetarian. You would love this place for sure. 2x shucked peas and borage gnudi. Want. Both. Again. Now. What a wonderful detailed review. If ever I have the time, I’d love to do a stage at this place. If you ever stage there, I will come visit you. What a detailed review! The pictures can make a man feel like eating 3 rounds. Good work.